Netsounds presents The Burning Hell + Randolph’s Leap (solo show). 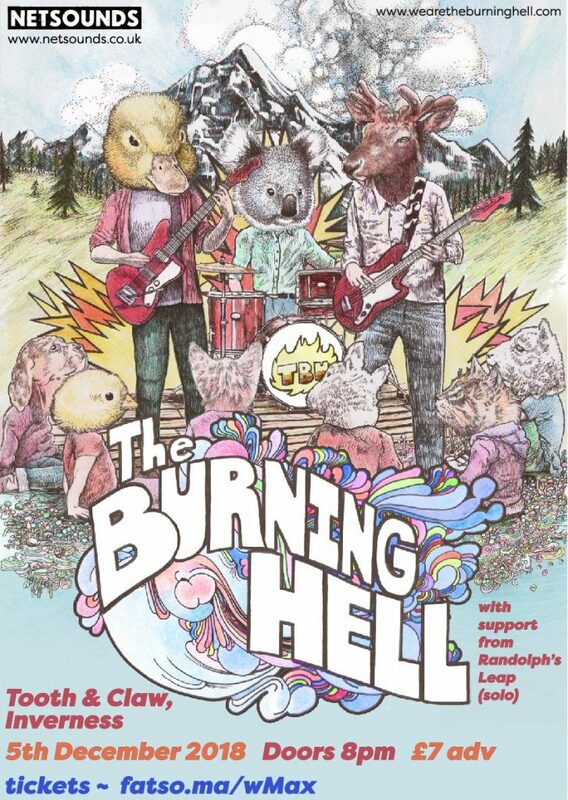 The Burning Hell follow up their triumphant Belladrum Festival show with a return jaunt to Inverness with support from Randolph’s Leap (solo show). The Burning Hell is the alter-ego of Canadian songwriter Mathias Kom, and consists of him plus Ariel Sharratt (clarinet), Nick Ferrio (bass), and Darren Browne (guitar). Loosely based in St. John’s, Newfoundland, Canada, The Burning Hell has toured back and forth across Canada and Europe since 2007, playing everywhere from festivals to bars to living rooms – and once even a mental asylum in rural France. The band has garnered acclaim for their hyperactive live shows and their caustic yet sincere lyrics, believing as they do that songs about the inevitability of death can also be fun to dance to. Randolph’s Leap are a Glasgow-based musical project ranging from a solo act to an eight-piece band. Nairn-born Adam Ross and friends have been writing lo-fi indie pop gems for unpopular people since 2010. The band specialise in creating a joyous, brass-tinged folk-pop racket which has grabbed the attention of major cultural figures across the United Kingdom. An extensive back catalogue of DIY home recordings was topped off in 2014 with their first full-length album ‘Clumsy Knot’, released on Lost Map Records. In 2016 the band released their second album with Olive Grove Records.